in rapid decelleration doesn't the charging system sense that as its fully charged and the engine is in a no-load condition the smart regulator disipates the alternator charge through the regulator hence the dip in voltage readings? if these thoughts are totally off the wall then im blaming the frigid temps........-30c again today .......wheres the Scotch!!! Last edited by the flyin' scotsman; 12-10-2016 at 02:42 PM. I can always take a data log and check the RPM-load-temp-voltage correlation. in rapid decelleration doesnt the charging system sense that as its fully charges the regulator disipates the alternator charge through the regulator hence the dip in voltage readings? The alternator itself doesn't have any speed-related dynamic voltage adjustments. The regulator just sees output voltage vs "setpoint" and adjusts the excitation current to the rotor accordingly. The setpoint changes based on temperature to protect the battery and the alternator stator windings, but since the load and temperature don't change instantly on decel, I don't have a good electrical explanation of why you'd see the momentary drop in system voltage. It may be as simple as how fast the one-way clutch "recovers" after releasing on fast decel, a mechanical drive issue. In a long-ago past life as a packaging machine designer/engineer, accommodating these engage/release/engage parameters "just right" was always a challenge, especially in equipment drives that changed speeds a lot. The clutches have little rollers that act as wedges in one direction to engage, and there's a minimum rotation (in degrees) required to let the rollers shift, plus a time component from the mass of the rollers as relative directions changed, and the time it takes to re-accelerate the load once the rollers do move and try to lock up again. perhaps not engine speed related but load related as in min. load on decel ? Im assuming the readings have been taken after the regulation portion of the system and the workshop MM has a relatively slow ability to instantaneously read the output values. I don't think anyone has any "serious concern"....just general interest in how the free wheel pulley works and what affect it has under quickly decreasing engine speeds. When I started this project, some two years ago, I considered many different alternators for my starting point. While some may have fit easier, they didn't "make the cut" in terms of the performance and reliability I was looking for. Frankly, if the alternator can work in a 911 engine compartment (which has temperatures several hundreds of degrees higher than we will ever see in our location) and can survive the rpms of a 911 engine, my intended application was a "walk in the park" for this alternator. As an added bonus, its made from all brand new components (not rebuilt), completely designed by Bosch (legendary reliability and performance, not "tweaked" by some alternator rebuilder with his own "backyard theory" on how to make more power), has twin internal cooling fans, exposed coils, has this great one way clutch (which significantly reduces belt heat and wear), and was close to what I needed to fit in the 928 location. This seemed like the perfect starting point for what I was trying to make.....all I needed to do was make it fit. Here it is....I think it is beautiful....and it works like a dream, in the 928 application. my posts are general cabin fever ramblings that, if nothing else, will help provide everyone who is paying attention technical answers from the masters who know. That answered my question, the clutch is good for the belt, works for me. Greg, I just did a bunch of load testing, very interesting. Sign me up for one please. (Sue would prefer the mat finish). 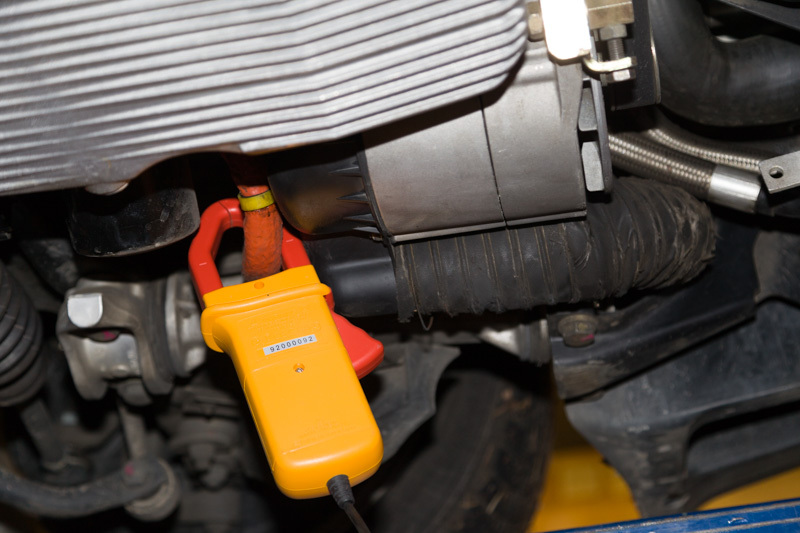 The bottom line is if we start the car and turn on the defroster and headlights, then we are discharging the battery; the stock alternator is done. The way this pencils out for our GT is 42 amps just to run the car with the radiator fans going-- this includes a '044 fuel pump, in-tank pump and wbo2 maybe 35 amps for stock. Now crank the blower up to max and the voltage drops from 13.9 to 13.4 (i.e. barely charging). If we turn the lights on then it goes off the cliff-- the voltage drops to 12.5 as the battery starts helping out. The alternator is maxed out at 55 amps, won't go any higher-- the battery just discharges faster. That's at 675 rpm, S4 idle-speed (in neutral; in-gear is 625). Our GT normally idles at 800, in that case with blower and low beams the alternator is putting out 77 amps at 12.9 volts-- still half-over the cliff. If we crank it up to 2000 rpm then blower plus low beams is 93 amps, and the voltage is 13.5 volts. With high beams the alternator hits the wall at 105 amps and the voltage falls off the cliff again. This is with no stereo running, no cosmic subwoofer, no rear A/C blower, nothing else. But we do have Roger's bigger blower motor, and H4 headlights. The impressive thing with the stock Bosch alternator is that it will hit its specified output after a many years and many miles. The problem is that the specified output just isn't big enough. Pictures or it didn't happen: Front to back is computer for Sharktuner (to diddle the idle speed), jump-post volts and the little multimeter for the clamp-meter on the alternator. ...AND...without engine bay temperatures to make it worse. Exactly what i found out, with my custom A/C upgrade, with more details about what each individual piece adds to the current draw. Any additional load in these cars (upgraded A/C system, better headlights, stereo upgrade) pushes the current load past what the stock alternator can put out. The number of original alternators still in these cars amazes me. I have changed very few of these alternators for reasons other than bearing noise. I can't remember ever changing one of the stock (late model) alternators for electrical reasons. This is one of the main reasons I stuck with Bosch for my high output alternator project....reliability was high on my list of requirements. I do think the primary from the alternator to the jump post and the jump post to the CE panel are often problems in our cars - with age especially - and to some extent even from the very beginning (both are undersized IMO). It is also important to understand that any resistance that builds up over time due to poor connections, oxidation/corrosion on the way to components - e.g. in fuse-holders, connectors or directly in the wiring causes overall LESS current to be consumed. It's not that extra resistance consumes or wastes current along the way (which is rather how it sounds described here) - rather it's that it just never existed. Resistance in the circuit just makes the loads seem smaller, so less current will be consumed when they are operating. There is also a power loss across the resistance (voltage dropped * circuit current), but the extra resistance alone directly causes the current to be lower at any given voltage. The load itself will therefore see a compounded power reduction: The current at the load will be lower and the voltage at the load will be lower too - because some voltage is now dropped across the circuit resistance. *However because of this the alternator may hold its voltage up a little better - compensating a little. 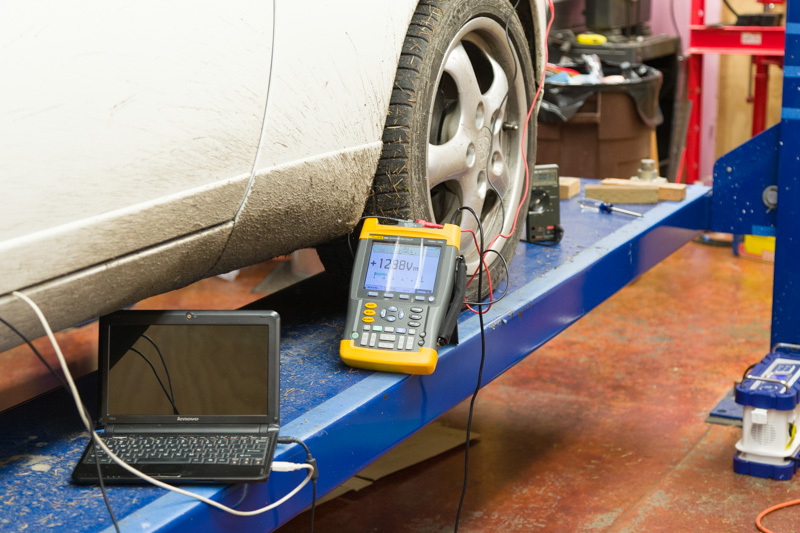 We usually measure voltage at the jump post, but this is not the true source - when running the source is normally the alternator - so measuring there directly would be best. If you do measure there and the voltage is drooping at idle with lots of equipment on - then the alternator is at fault. If you see a big difference in voltage between idle and 2K+ RPM then the alternator is also at fault (assuming the battery is ~OK). Now since we are usually measuring at the jump post - what we actually measure is the voltage after a possibly significant voltage drop across the alternator to jump post wire, a common enough problem area. A good idea would be to have a separate unloaded sense wire in the loom from the alternator to the jump post area so you could easily measure the alternator voltage directly. Measuring the voltage drop over this Alt to Jump Post primary wire is a worthwhile exercise - a voltage drop >>0.1V @ idle should trigger fixing this connection. Cleaning/improving everything else is of benefit mainly to each system itself. As Greg noted also check the engine ground strap condition - it is also part of this loop. I do think this time of year is not the best to test alternators - the most challenging time is mid summer when fully heat soaked at night, idling with AC & cooling fans on full with all lights. This is the real challenge - and it is mostly driven by the aggressive temperature compensation in the regulator and the poor low RPM generation at idle for the stock alternators, (esp for low idle RPM cars). I agree with Jim - the stock alternator is quite marginal at hot idle (and the hotter the worse it is - Phoenix is NOT good for this), any extra loads take you over the edge quickly..
To me an alternator that can reliably generate better at idle RPM and also one that de-rates less over temperature is a good thing for a 928 - in moderation. I do think the biggest problem here is the alternator and secondarily the primary wiring. Now the "in moderation" is important - because charging your battery at 14.5V continuously - even at high 30C temperatures runs a very serious risk of damaging it (or exploding it). You could boil and lose electrolyte and suffer serious outgassing if you run this way long enough. So ideally you'd have some direct battery temperature control over charging, but typical alternators don't do this at all - all they have is a setpoint voltage at the alternator and an (alternator) temperature derating curve. Based on the hot idle results Greg shows this alternator seems to still perform just about right in this respect - good. This is a great option here (though $$$) - especially for cars with extra loads to drive or that live in very hot places. The key to my posts was that no matter how much current you're developing, my original theme was to correct the resistance loads that aren't contributing to car operation. Having said that, my subsequent post after Greg brought up the deal about the idle performance, I was convinced and said so. Measuring the voltage drop over this Alt to Jump Post primary wire is a worthwhile exercise - a voltage drop >>0.1V @ idle should trigger fixing this connection. Cleaning/improving everything else is of benefit mainly to each system itself. As Greg noted also check the engine ground strap condition. Thanks for that explanation. We are very fortunate to have a resident electrical expert who is willing to share his vast knowledge! I always assumed, now to find that my assumption was incorrect, that an increase in resistance (through oxidation or a poor contact) increased the current draw through an individual circuit. Makes total sense when I stop and think it over ....if the current draw actually went up, the fuse would blow. Again there simply are no "resistance loads" any added series resistance causes reductions in the existing loads - never additions. Series resistance is always additive - and you don't have any added parallel resistances in this case. Lights are lights, and motors are motors indeed - but what current & power they get is dependant directly on what voltage they see at their terminals - this will always be a lower voltage when there is series resistance in the circuit. This lower voltage will mean they will also get less current than they would get without the resistance present. The total power transferred to the load will be a lot lower too because it is then ~a square law to the voltage reduction. Circuit current here is always dependant on voltage, there is power consumed in the resistance but there isn't any current addition due to the resistance. Net current & total overall power will always be less than a case without any added series resistance present. It's not always obvious or intuitive - but it is always this way.